The Dash Chef Sous Vide is an average quality sous vide cooker however it isn't competitively priced. We recommend the Wancle Sous Vide SVC001 instead. $89.4 Current Price - YOU SAVE $27.92. 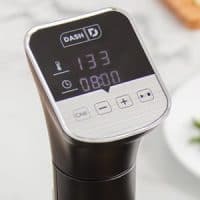 The Dash Chef Sous Vide is a mid-level precision cooker, the quality is average, however compared to other similarly equipped models it's more expensive, making it, not the best value for your money. The Dash Chef Sous Vide is $89.40 , compared to our second highest rated model the Wancle Sous Vide SVC001 for $87.99 which we feel is a much better value. This model is 15" in height which makes this model average sized of all the models we reviewed. it has a standard strength housing and a stainless steel tube housing for the heating unit. It has an alligator style clamp, which is easy to set-up and cleanup and put away, but it doesn't off a lot of flexibility for vertical adjustment. There aren't any big problems with this model it just doesn't offer the best valued compared to the other models we reviewed. For just slightly more money you can get our second highest rated model the Wancle Sous Vide SVC001 which is a much better value.